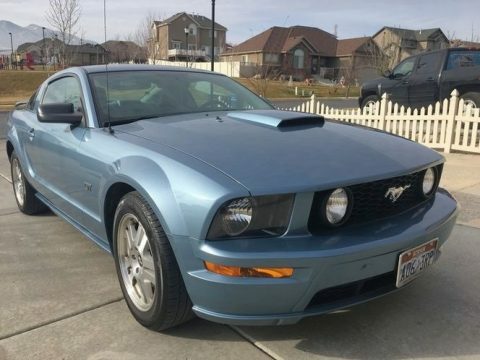 2007 Ford Mustang GT Premium Coupe For Sale in West Jordan, Utah 84081 **"On Sale Due To Relocation. Happy To Look At Any Reasonable Offer"**Get ready to stand out from the crowd with this 2007 Ford Mustang GT Premium Coupe! This vehicle features a handsome, athletic styling that is dressed in Blue Metallic Paint exterior complemented by a Gray interior. Powered by a 4.6 liter V-8 engine this fast, fun, and fierce ride comes with 5-speed manual transmission. With only 63,500 miles you can rest assured that this Mustang will provide the adrenaline rush you seek for many years to come. This 2007 Ford GT Premium comes fully loaded with options and features that will easily feed your need for speed. Highlights of These Features Include: AM/FM/Satellite-Capable RadioSix CD Disc ChangerShaker 1000 Audio System Including Eight SpeakersCruise ControlTwo Power OutletsPower LocksPower SteeringPower WindowsFour Snow Tires With RimsAnd So Much More!!! This 2007 Ford Mustang GT Premium Coupe has been meticulously maintained. It has never been smoked in and has always been garage kept. This is a must see/drive to truly appreciate everything it has to offer. In fact, come see for yourself! You will agree that you cannot find another 2007 Ford Mustang GT Premium Coupe in this condition for the asking price. Call today for more information on how you can get experience life at full throttle with this unparalleled Ford Mustang GT Premium!! !